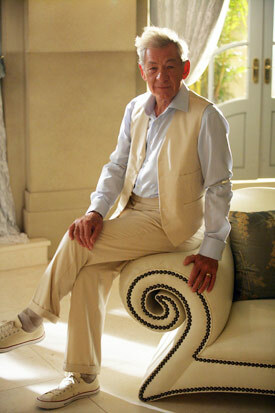 While Matt was visiting at the ha-hacienda last week, we sat down and watched The Prisoner episode 6, Checkmate. He opted not to say anything for the moment, preferring to let me dig my own grave. As with all of my other Digressions, there are SPOILERS ahead. Part of the confusion I had with this episode is that as time progresses, counterparts in the Other Side and the Village start wearing the same clothes. This is by design, I’m sure, to demonstrate the two worlds closing in on each other, but it did lead to some confusion. We learn that the entire Village and all of its inhabitants DO live in the mind of M2. They are sent there for rehabilitation but ARE eventually allowed to rejoin the real world. This is why 2 was blowing up Villagers with grenades in the first episode, and that’s how he makes his permanent return. I pleased to see I was right in my reasoning why 1112 couldn’t make it to the Other Side, and it was fairly interesting that his birth was an experiment by 2 and M2 to see if someone could be born in the Village. 1112, fed up and confused by The Village (I can relate), kills M2 and himself in the Village, which causes the holes to start destroying everything. 313, who would never be able to return to The Other Side due to psychotic baby stabbing, volunteers to take M2’s place as the dreamer and holder of The Village. In the end it was pleasant to see 2 and M2 get a happy ending back on The Other Side, free from the burden of governing. Meanwhile, Michael sits down at Summakor and 6 takes 2’s place in The Village. I can even imagine this happening over and over again, as 2’s search desperately for their own replacements. Not everything was answered: Does The Village still exist, or will our new 2 have to rebuild it? Who was 2×6? Why was everyone spying on each other? This seemed to be more of a holdover from the original series than a necessity of the new one. And none of addresses that the moral questions. Was 2 wrong? They were providing an environment for therapy to take place and releasing their “prisoners” at the end (the Villagers may have all been kidnapped, which makes it less of a gray issue). All said, I really enjoyed the remake. Despite the fact that I wound up confused for some time thinking this was another spy story, trying to recreate the spy elements from the original would have been setting themselves up for failure. This version took the key elements from the original and made something entirely new and compelling. And if this remake wasn’t your cup of tea, the original is still there for you without the burden of continuity. * A special thanks to my Dad for being able to track down the “pigger counter” poster. ** A double special thanks to everyone who’s found these digressions interesting. I didn’t actually think I’d post about every episode, but these Prisoner posts have been getting more hits than anything else I’ve written. No One Gets Close To 2. Unless 2 Wants Them To. 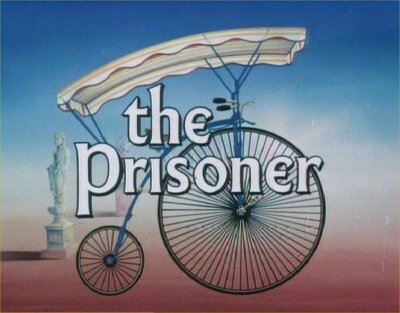 Last night I finished The Prisoner’s 5th episode, “Schizoid”. I don’t think I understood it, but I think I may see where we’re going. We open with 6 being shunned by his friends. Apparently his doppelganger, 2 Times 6 (originally 12 in “The Schizoid Man” from the original series), has been impersonating him. Is he a clone, a duplicate, or a head-trip? Or Michael from The Other Side? There’s a fascinating game being played here. 2 obviously knows who 2×6 is, but isn’t telling. In the meantime he plays “Prince and the Pauper” by ruffling himself up and going out into The Village as a numberless man, the un-2. We do learn a few things, though: The holes are created when 2’s wife is awake, which is why she is drugged and kept asleep. 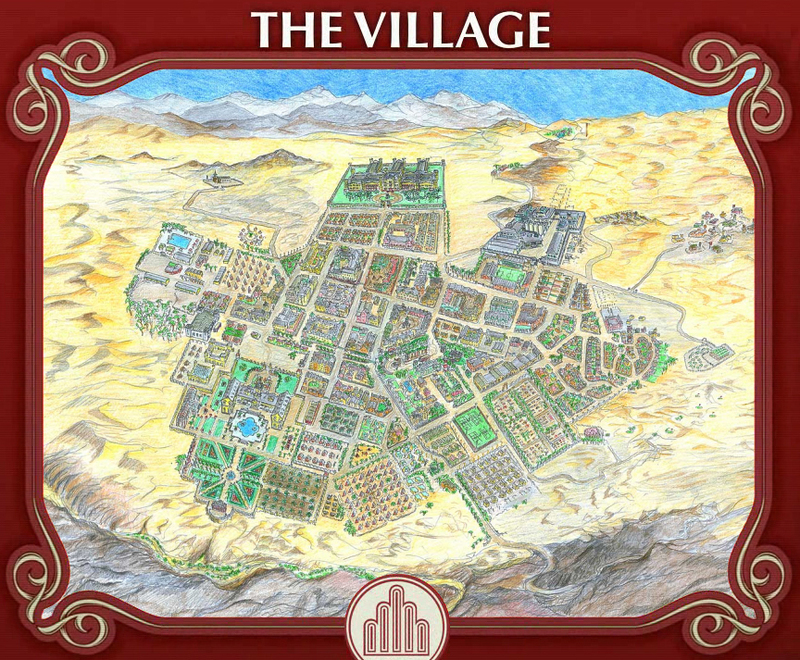 We’re also told that The Village is in the mind…But is that a metaphor or the truth? We also find that there are doppelgangers of all our major characters. So we definitely have two worlds, The Village and The Other Side (our world). I was originally going to posit that because The Village is supposedly all mental, I think 6 created The Village, and it’s all in his head (we all make our own Villages). That would probably ALSO make him 1. Thinking about it more, that doesn’t fit all the clues. I think it’s all in M2’s mind, and her dreaming is keeping The Village together. It also makes sense that real person could show up in a dream but a dream could not go to the Other Side. The monitors at Summakor would be keeping an eye on the dream world (The Village). I’m psyched to see how it all wraps up. The show’s been getting mediocre reviews, so I’ve been worried that I just like this because I like the original, but the way they’ve got me curious for the end, I think I can put that to rest. One episode left, then a wrap up. Be Seeing You. Get a Pig — For Stability! I’m getting hammered by apparently everyone for being behind, being dumb, and not having watched the last half dozen episodes of the original series recently. To which I reply: uhhhhhhhhhhhhhh… Still, I have to call it like I see it (or don’t see it), and I’m going to keep rolling, even if I’m already wrong and alienating the 3 people just coming here for dumb cracks about comic books (hi, Mom!). Prisoner episode 4, Darling, really hit the right notes for me in terms of keeping the tone of the original series. We start with 6 waking up to the most ludicrous idea humanly possible, in this case a Village Matchmaking Service, he takes the bait but it’s really a misdirection while he’s being abducted in his sleep and given injections of things. The mystery of Lucy/415 deepens, as do the secrets of 2’s family and the pills he gives his wife. Also reminiscent of the original series is that 6 is ALWAYS wrong about women. – No one is asking 6 for anything. So why are we playing this game? – Wait, but he asked 2 about New York and 2 said “There is no New York”! But wait again, why wouldn’t he have said “What is New York”? – 6 doesn’t seem to be trying to escape. – I have no idea what Rover is doing. He lights up and…Some people die and some people wind up back in their beds? Not much more to say, really. We’re smack dab in The Middle right now, with (apparently) all to be revealed. Forgive me as I get caught up. My brain is a pretzel. P.S. – Anyone know of a link to the pig poster? I can’t find it anywhere, and it was awesome. I love the idea of a Stabilometer. Or as I like to call it: a Pigger Counter. I’m pre-empting my regularly scheduled look at this week’s comics for a Digression. Because we’re right in the middle of the new Prisoner mini-series, if I want to discuss my impressions of last night’s episodes I need to do it today, before I’m either proven right or wrong. The Prisoner has always had a cult-like status in my house, even when I was a kid. I knew about the trippiness of that show through my parents but was only able to catch an episode or two every once in a blue moon. It wasn’t until the age of DVD and cable reruns in the past 5 years that I’ve been able to really fill in all the blanks. Then even with all that, I’ve still never seen Fallout, the last episode. Still, I’ve been a fan for a long, long time: I’ve read the Prisoner mini that DC put out in the 80’s, my dad and I have been swapping links to gossip sites about a possible movie for years, and the Numbers and Rover outside the San Diego Convention Center last summer fascinated me more than anything else at the Con. 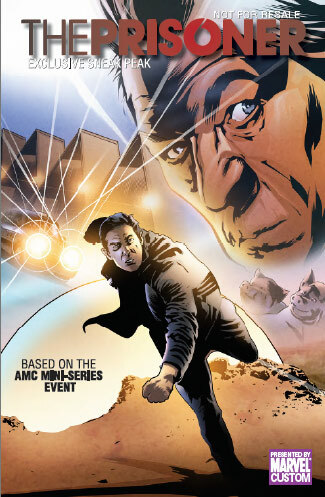 So it’s safe to say that I’ve been looking forward to the new miniseries on AMC for quite some time now. The biggest thing I have a problem with is that they appear to be giving us answers. Not that I don’t want them, of course, but I don’t think we’re SUPPOSED to have them. If Patrick McGoohan had meant for them to be revealed, he had plenty of time to do so himself. Already we know 6’s name (Michael) and occupation (analyst for a CCTV company), and it looks like we’re going to get some backstory for 2 and The Village, as well. I also didn’t care for the manner of 6’s resignation. Spray-painted on a window? Quite classless. Plus, I always thought there was key information in the papers he handed in, details a little more subtle than graffiti. I think I just have to resign myself (ha ha) to this show being a different animal (which is obvious to everyone but me, I suppose). Making that somewhat easier is the fact that this appears to be a continuation of the original series, which means The Village has had 40 years to work on its technique. When our new 6 wakes up in the middle of the desert, the first thing he sees in a man being chased by armed guards. The Prisoner preview that AMC has been showing explicitly says the man — 93 — is supposed to evoke the original Number 6, but I think a strong case can be made that he IS that Number 6. 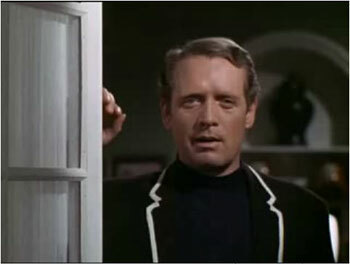 The age is roughly right, and he was wearing the same black jacket with white piping that McGoohan made famous. From the neverending carousel of Number 2’s we’ve seen, we know that numbers are dynamic, and 93 — or rather 9 minus 3 — cannot be a coincidence. We also see 93’s apartment, which has the same round portals and lava lamps that graced Number 6’s in the original series. There are other nice touches: the new episodes all have titles tied to the originals. Rover is still guarding against escapes. Cars are 40 years old. The rest of The Village is mostly oblivious to their plight…I can keep going, but won’t. The show itself? Well, so far it’s a nice little head trip. 6 arrives, meets 2 (and his bizarre little family), gets a tour of The Village and starts tracking down the mystery of where he is. He discovers he has a brother (or does he?). Nothing seems right, and yet there are some things innately familiar, including a box he buried as a child is right where he left it. We’re only 1/3 of the way through, but I’m anxious to see where we’re going. I’m sure we’ll have to wait until the end to take in everything as a whole, and (hopefully) there will still be some unanswered questions. 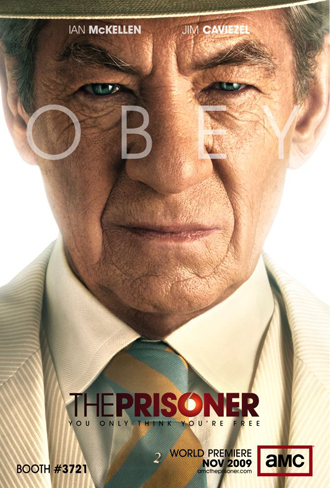 The Prisoner has always been about the battle for knowledge. Just as Number 2 and Number 6 will always battle each other for information, so do the fans and the writers. But it’s also about futility. Can Number 6 ever win? Can he escape? Can he accept those things? And that, too, has been the same for fans. Matt’s off to The Village himself this week, so you’re stuck with me, but I have a lot planned. Tomorrow I’ll take a look at this week’s comics. Wednesday will be a review of some incredibly awful comics from last week (and hopefully one or two good ones). Blackest Night talk is pushed back to Thursday. Friday I take a victory lap and collapse.